I'm still procrastinating, you guys. So last night I thought I'd play with cardboard - the grandest way I know to avoid sewing things I'm supposed to be sewing. 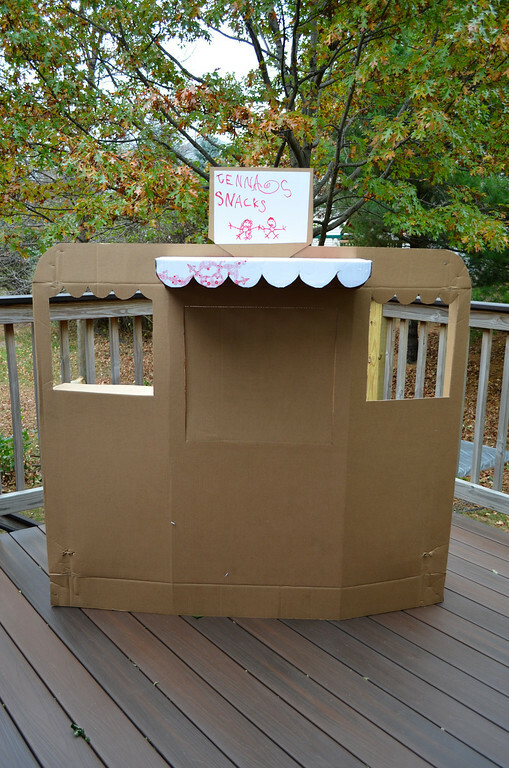 I'd wanted to make the girls a shop for the longest time, and I had this big piece of semi-superior cardboard in the garage, so long story short, I made them a shop. It took me three, maybe four hours. That's nothing for a cardboard project. I'll walk you through it. 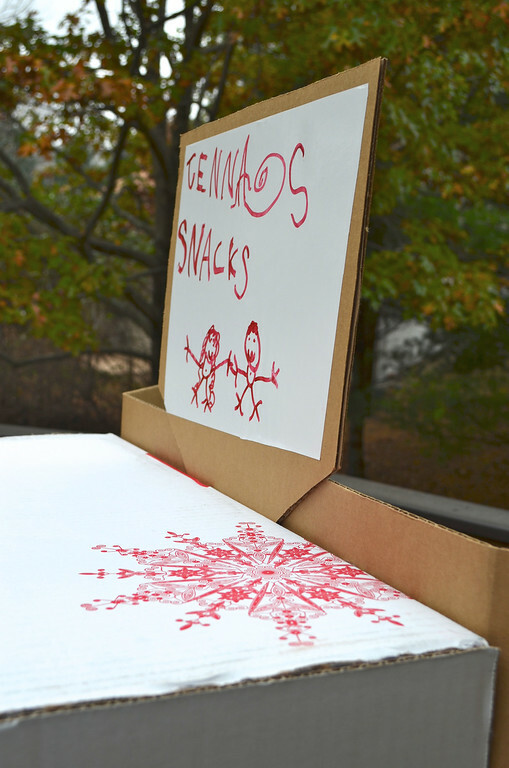 and then stick two boxes to the backside of it. 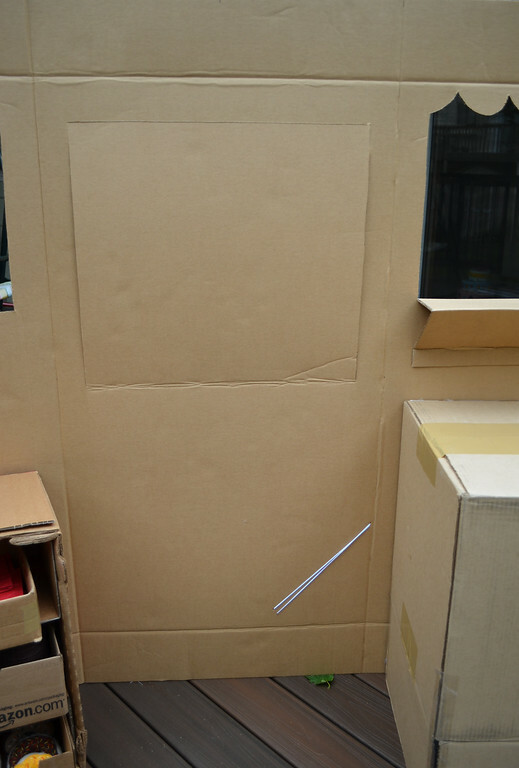 These boxes are to stabilize the shopfront, okay? 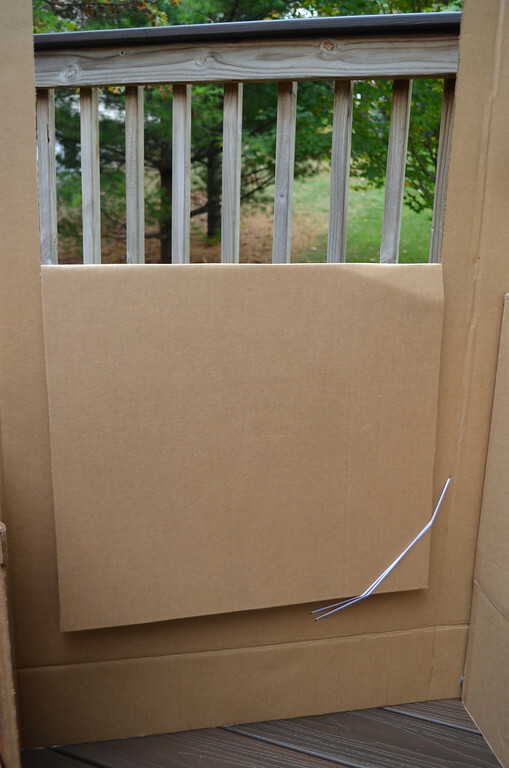 This way the big piece of cardboard doesn't fall down. 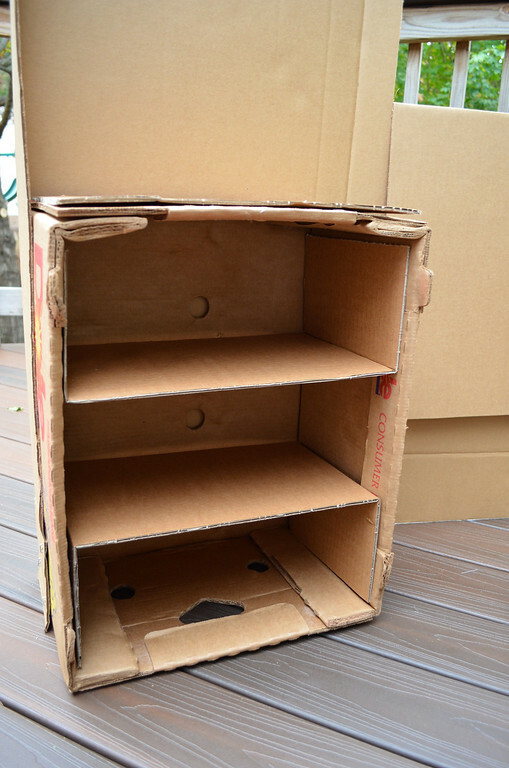 They can be any kind of boxes. See? It's just a box. The other box I had was a crate-type thing (it used to house bananas, apparently), so I stood it on its end and made shelves. Then I found old boxes (amazon etc.) for drawers. 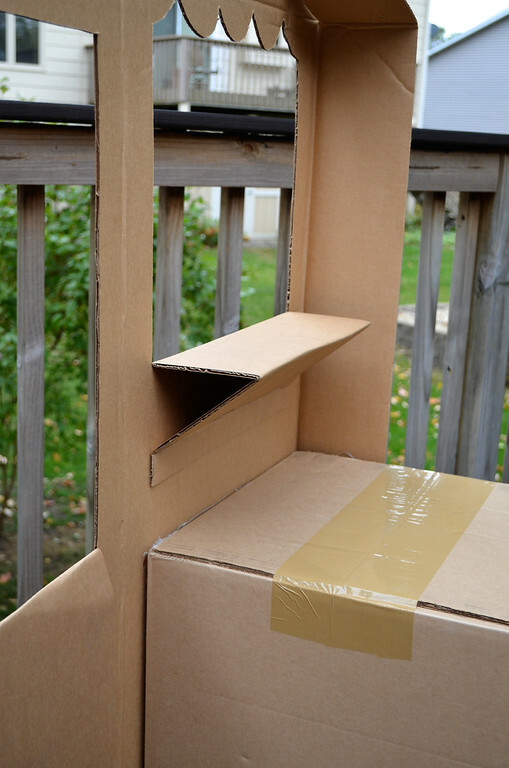 or bend the side walls at an angle - both configurations will be stable. Then you cut holes for the windows. You can make them scalloped at the top like the side windows here, or just straight across like the main center window. 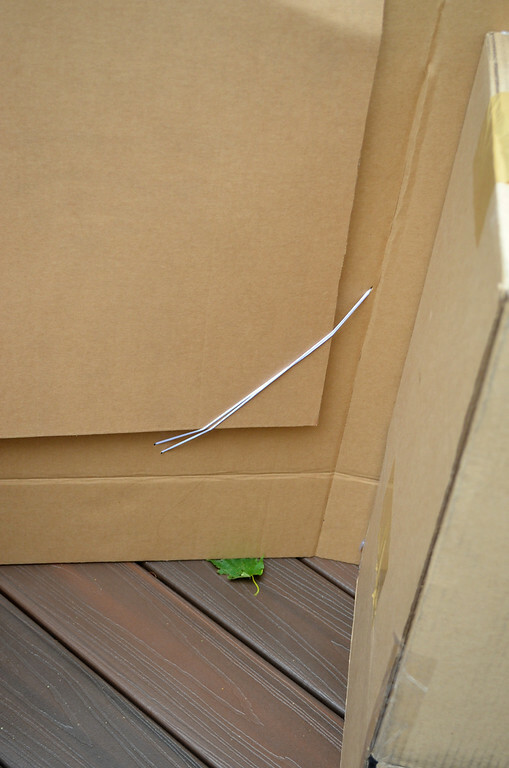 If you plan ahead a bit, you can do two things with the window-flaps (so don't slice them off at the bottom edge yet). that flips back up to shut the window, like for when the shop is closed and the shopkeepers are out to lunch/school. I used some random elastic cord (doubled, because it was too long) to hold the corner of the shutter down. The signboard has a big piece of whiteboard contact paper on it, so the kids can change the shop name. I think I might stick on some chalkboard contact paper to the backside of the board - it would be very Mr Hooper-ish (remember him from Sesame Street?) and charming. I doctored a compartmentalized box that used to hold oversize Christmas ornaments. It was very deep - deep enough to stash shoes, so I cut it at an angle, which made it automatically shallower, and then reattached the backboard with glue. This cubby-hole display isn't attached to the shop- it just leans against it. Altering the original compartmentalized box into this angled cubbyhole display took me a good hour, largely because the cardboard was so rigid (translated: superior) and hard to cut through. But it was worth it because this section alone is as sturdy as wood, and just as painful should it slide down and land on our toes. And here's a picture of Jenna playing shop this morning, to give you an idea of the size of the shop. This was before I added shelves to the crate-box, incidentally. It was an afterthought, sort of, but I like how the shelves have added to the whole play experience because the drawers are almost like additional display cases the kids can take out and shove under the noses of customers. 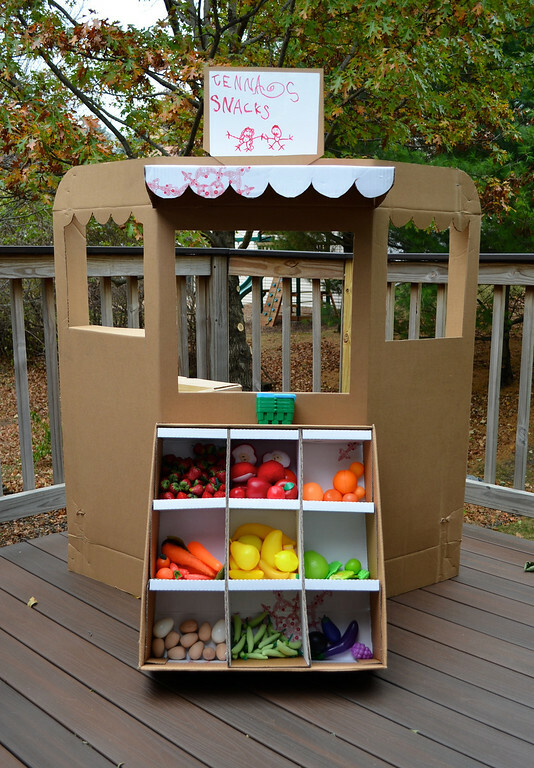 I could add any number of features to this shop - hang-on-the-wall telephone, little box to hold grocery bags, hooks above the windows for hanging wares, turn the big featureless box into a refrigerator..... but I'd wanted the kids to give me their ideas. They've just started playing, so we'll wait and see. And now, I feel I really must attempt to start on those costumes. Two days ago, to assuage my guilt, I drew three semi-circular skirt patterns on taped-together newspaper sheets. It made me feel very accomplished, so I folded them up, patted myself on the back and went on my merry way. That penance has worn off now. Today, I'm beginning to feel guilty again. And since I don't think the Fabric Elves are going to show up, I need to start tonight. Really. So I might be quiet for a while. If I turn up here again talking about knitting or scrapbooking or electronic components, yell at me, will ya? That is adorable! Your kids have the best mother! LOVE the shop! 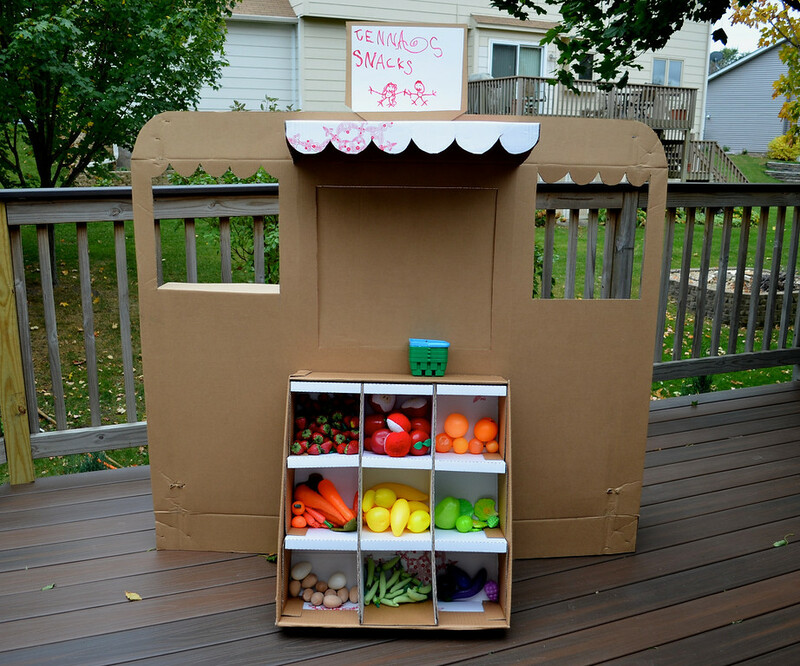 I think the compartmentalized produce stand is my favorite part. I just acquired fabric to make the girls Halloween costumes tonight (with Lily having a meltdown in the checkout line because she only had a 5-minute nap thanks to Johnny, which led to another shopper chewing HER out. Who tries to chew out a screaming 2yo, even if she does look three years old?) BUT this means I have costumes to make - and I'm considering making Johnny a costume. We'll see if it happens, or if it goes the way of my planned summer sewing... They all have backup costumes, but it would be fun to sew something. 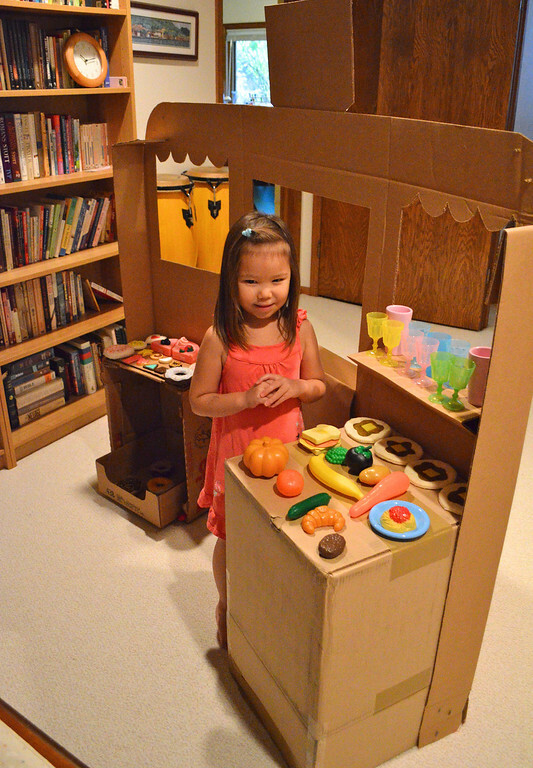 I hereby dub the "Queen of Cardboard." Again. I'm sure many have dubbed you with the title before! Fabulous shop! I love all of the details you incorporated into it. 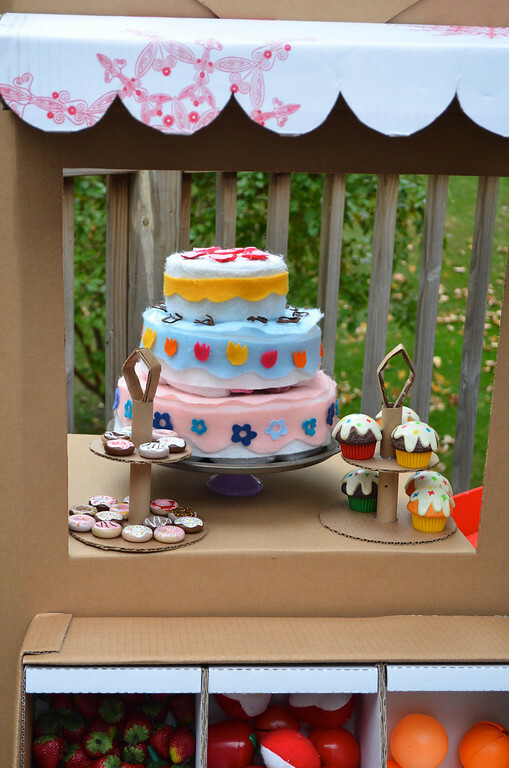 I want a tutorial on those cute cardboard tiered cake stands. Love the shop. 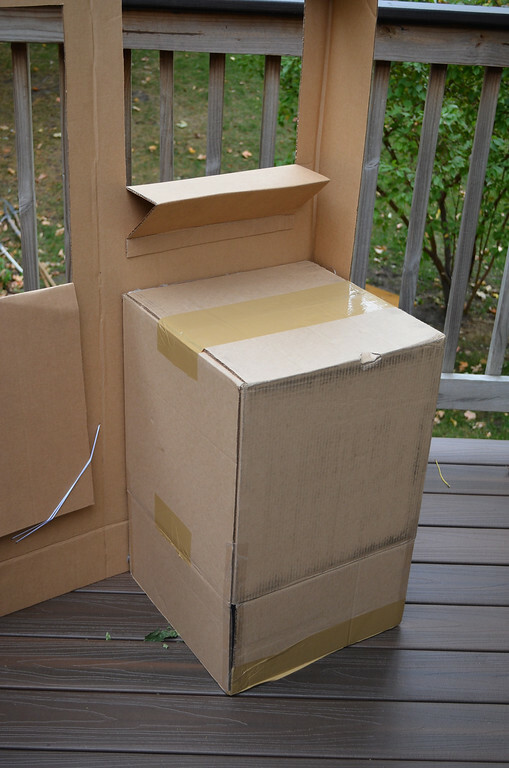 I need to find a big box & do this. What a great use of time! I love it! That is so cool. 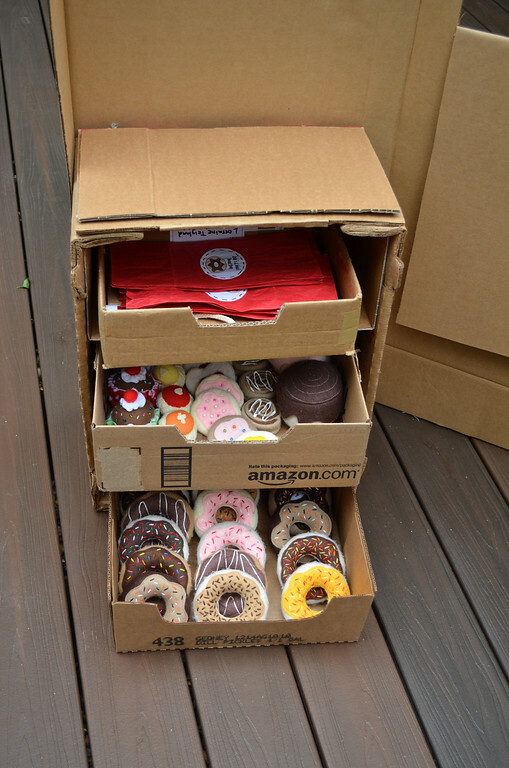 Love all your food- those donuts look good enough to eat. So do the strawberries! You need to add the till! Get that cash rolling in! Good luck with starting the costumes I am prevaricating too! Great job. Makes me want to play store too! 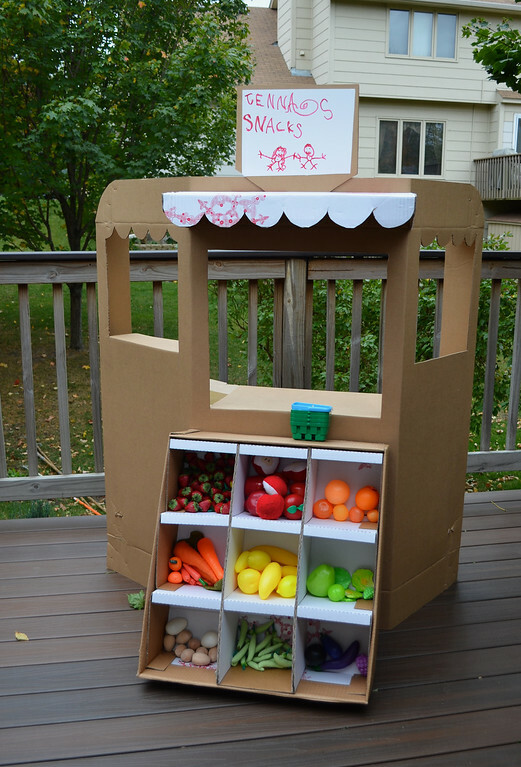 I can't wait until my little one takes an interest in playing store so that I can have an excuse to make her one. Thanks for sharing and love the felt food. You are awesome! I love the felt cakes too! Very creative! Im SO DOING THAT! I nominated myself to create a christmas float for our playgroup and months ago I decided on a cooking/creative kitchen theme and that I was making a carboard oven, as all of this has to go on a car trailer I was worried how I was going to get it all to stay upright. Then "THE GREENGROCER POST" came, it could have had my name on the title, thats exactly what I needed to see so now I know how I will hold it all together. I know I have said this before but "Will you be my Mummy?" I thank you and my kids playgroup thanks you in advance because the idea is still only in my head, I probably wont sleep tonight because Im so inspired and excited. This is so cute and brilliant that I think I just died. I, too, love the drawers, and I love how you use every little element and don't waste anything-- don't cut those windows out, use them for ledges and shutters! @NickyNicky, it's funny you should mention the till. I suggested to the kids when they started playing, that they should have a cash register. One kid said, "oh, yeah!" and ran to get it. Another kid said, "No! It doesn't fit!" and refused to have it. The third kid was wisely neutral. Very strange, how optional money is when they are so young, huh? 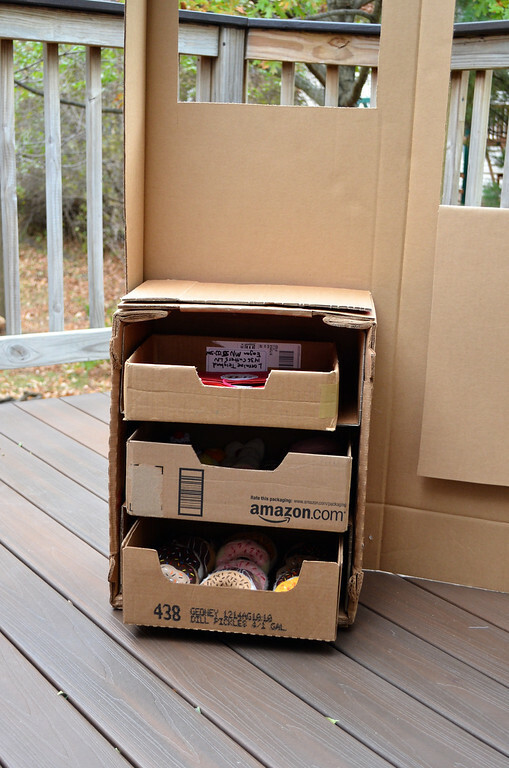 It completely depends on the superiorness of the cardboard used. Some things I've made didn't last more than a few weeks - these are usually the horrible soft corrugated cardboard or the cereal box rubbish that gets sat on once, and dies. Others - like the mailbox that is making its rounds on the internet, have survived three+ years since I made it. Also the suitcases, that I am wishing would collapse and die so I can throw them out. The hasps and clasps have all fallen off but the cardboard itself is hard as wood. And our stoplights and traffic signs died early, while the cars and scooter themselves lasted so long we had to hack them apart to get them in the recycle bin. If they fall apart, it's easy because they go straight into the recycle bin and no one feels remorse, only relief. My husband has a good way of helping us throw away cardboard things, especially the cardboard things that are in good condition when we're tired of them, or find they're taking up too much room. He says, "The fun is in the making." And we chant that to ourselves as we throw them out. The girls whisper to themselves, hopefully, "And we can make them again." It seldom happens - making the same thing twice, but it's the thought that helps us be less sentimental about throwing away cardboard creations. This is probably why I prefer to buy clothes than sew them - I feel absolutely nothing when they get holes and rips and I have to throw them away. Ohhhhh, I am in awe once more! You are such a super mom. This green grocer's shoppe is amazing. I love it when your blog arrives in my in inbox. I read my DDH's emails first then yours forwarding many on to my DD, and her boys, (the 10 year old just sewed his own viking costume with a quilted armor vest trimmed in fur,and fur boots!!! Between the two of you I feel rather unproductive and uncreative. lol). However, you are about to convert me to a cardboard fanatic. lol The other day we were at the bike shop when I saw a young man taking huge cardboard bike boxes to the dumpster. It was all I could do to keep from calling out, "You can't throw those away! I "need" them!" lol lol sigh I'm a cardboard wannabee. Thank you for sharing your talents with us. You really are a terriffic inspiration! We made one. I will have to send you the pictures. We went with cash register. My son loves to push the buttons. Thanks for the idea. I too needed another reason to put off finishing the Halloween costumes which I need done by 2pm today... best get to work. *breathing heavy...... panting...... cough.....deep breath....* I did it *....more panting...* I read *....cough...* every *.....panting....* single *....one more deep breath...* post *....happy sigh...* in your archives!!!!!! I L-O-V-E your blog. Just love it. I've clogged our computers bookmark bar with (organized) saves of all your amazing ideas. Your tutorials are fantastic. Your amazing parties & every day play themes for the kids are just wonderful. I have a little boy and I plan on adapting as many of your wonderful ideas as possible to become Super Mom:) One day, I will be creative in my own right. When that time comes, I know I will have you to thank for the inspiration. Thank you so much for these posts please don't ever stop! So fun! I remember back when refridgerators and washing machines came in big boxes that you could turn into club houses. 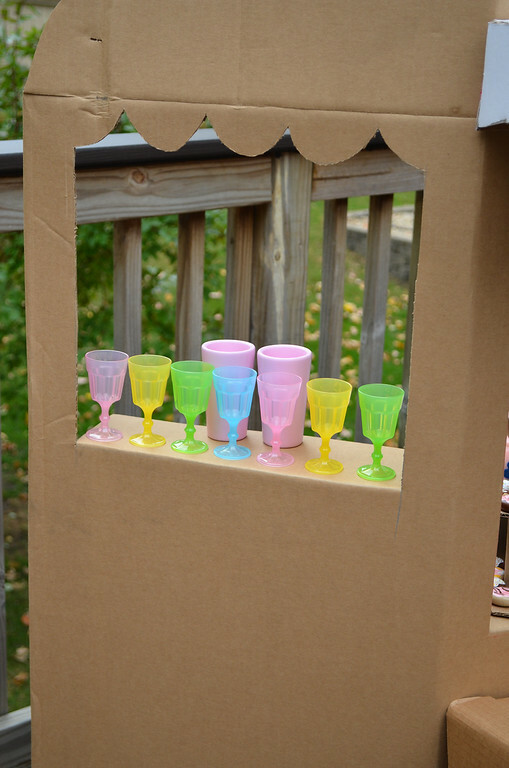 Such a great upcycling idea Lier! 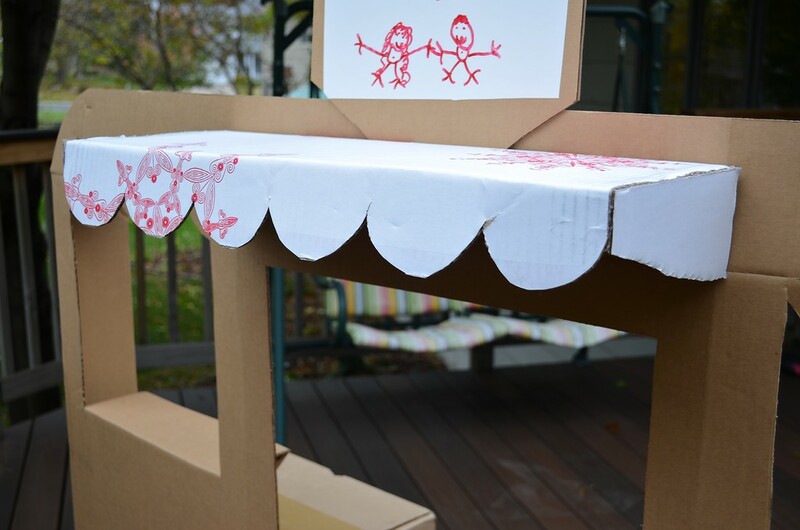 Great for cold days indoors .. the kids could paint and decorate this too and use up some stir crazy hours indoors. 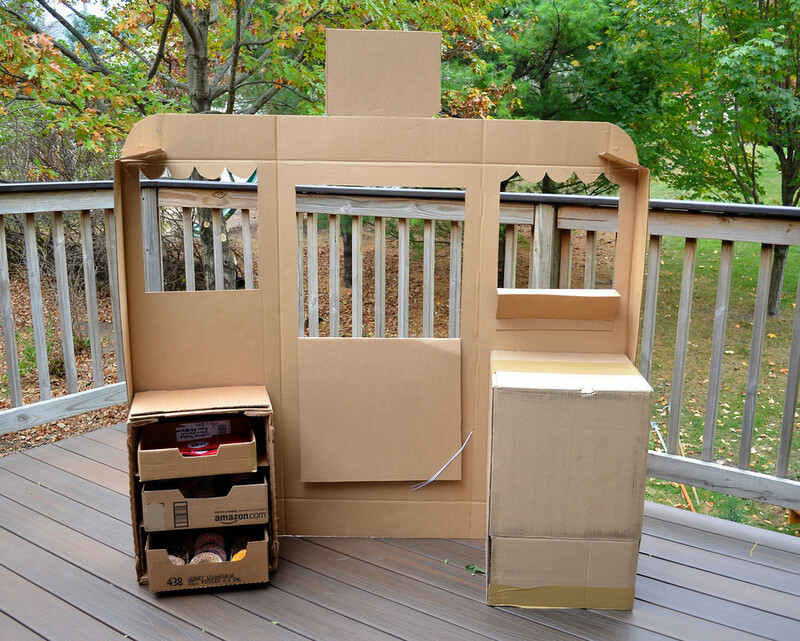 My husband is the "King of Cardboard" in our house - I showed him your creation and he is quite impressed. Going to bookmark for him to create when we collect the cardboard :) Thanks for sharing! Absolutely grand!!!! 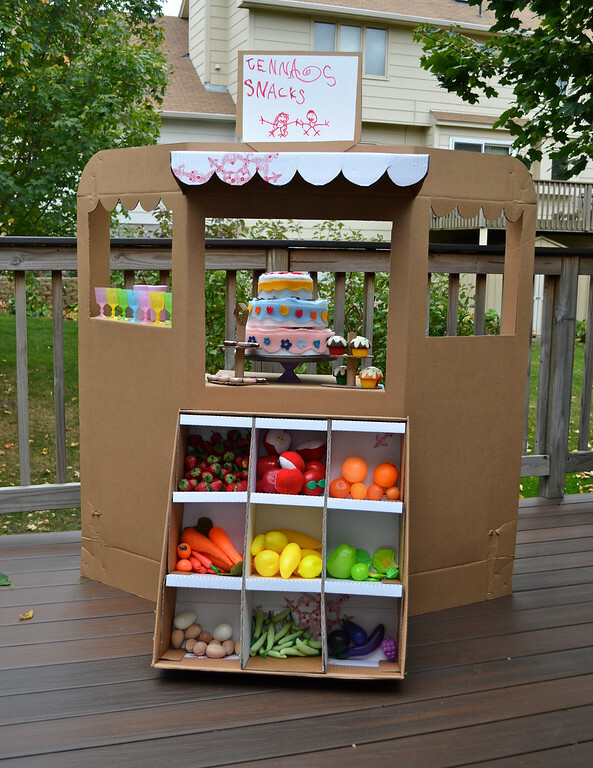 I have two small grandchildren living with me that need this!! Fabulous project! Just checked in, and you must be sewing! Can't wait to see the costumes. 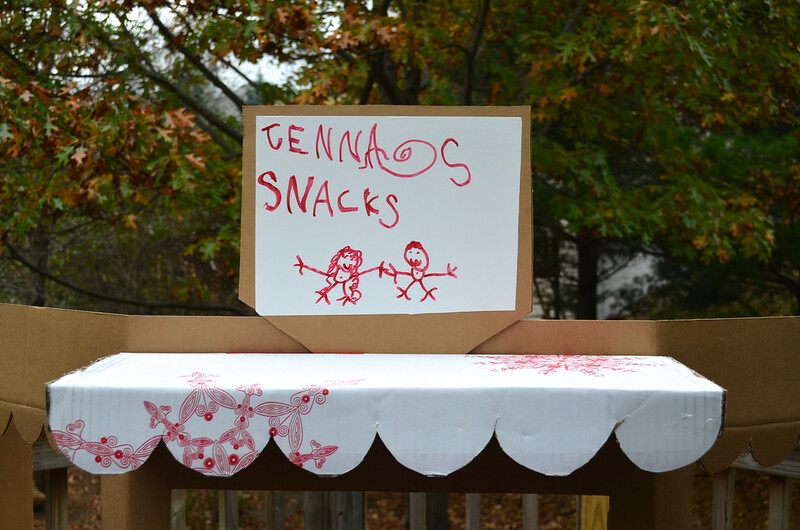 My kids have figured out a way to finagle candy during playtime. They change into previous costumes and knock on my door, in the kitchen. Trick or Treat! I plop a candy=one jelly bean or 1 skittle into their jackolantern bucket loudly and wait for them to say thank you and then say, Happy Halloween! What a great idea! I will making this for my son! I think he would love this and his mum sure will do! That's just brilliant. Now where can I get a cardboard box big enough? wow! truly brilliant. I would love to make one for my boys... thanks for the inspiration! Love all your works. OMG!! you are so creative, where do you find the time to make these things, sew, raise a family??? I love your blog and regularly check it. Thanks for sharing your amazing self. I absolutely love it !!! 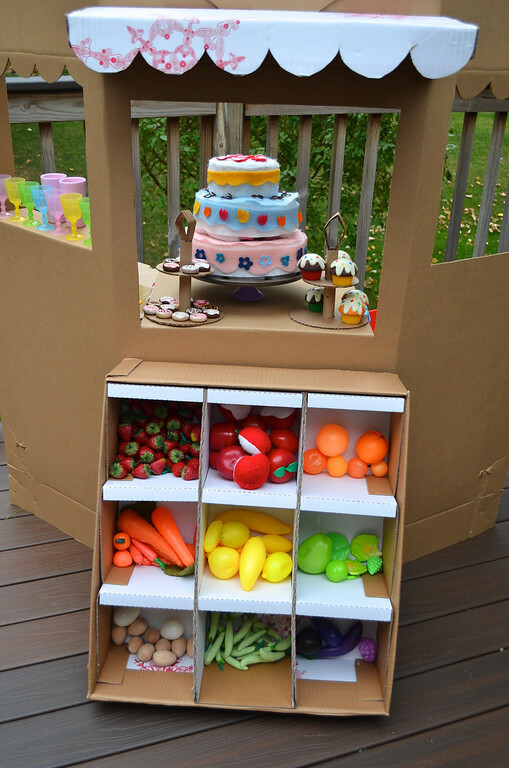 thank you so much for sharing, we have just moved so I should be able to find some boxes to make this project! 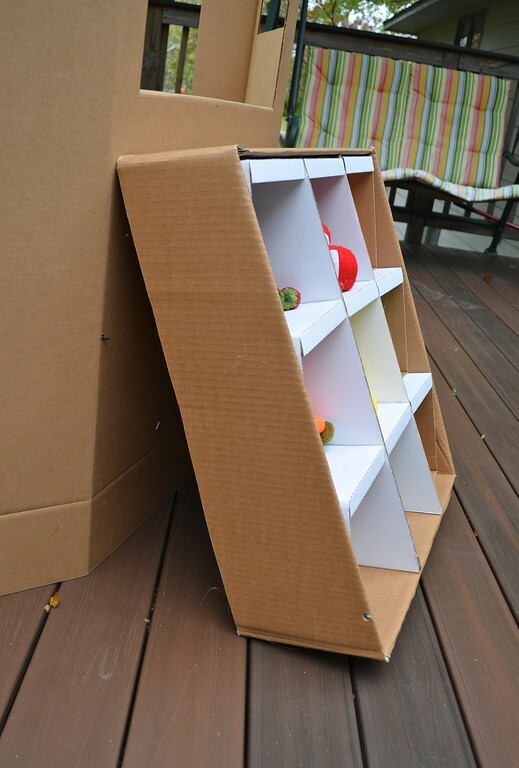 I love all of your cardboard tutorials -I have pinned some photos for ideas to use with my kids and also posted a photo or two on my blog (with link back, of course)in a cardboard "round-up" I did. Then today I opened up my Family Fun magazine and there you were! That is so exciting. This is completely fabulous! I'm linking you up to my What I've Been Up To Wednesday link party. :) http://blog.thecelebrationshoppe.com/2012/05/09/share-your-ideas-link-party-3/ My readers will love this! Fantastic! 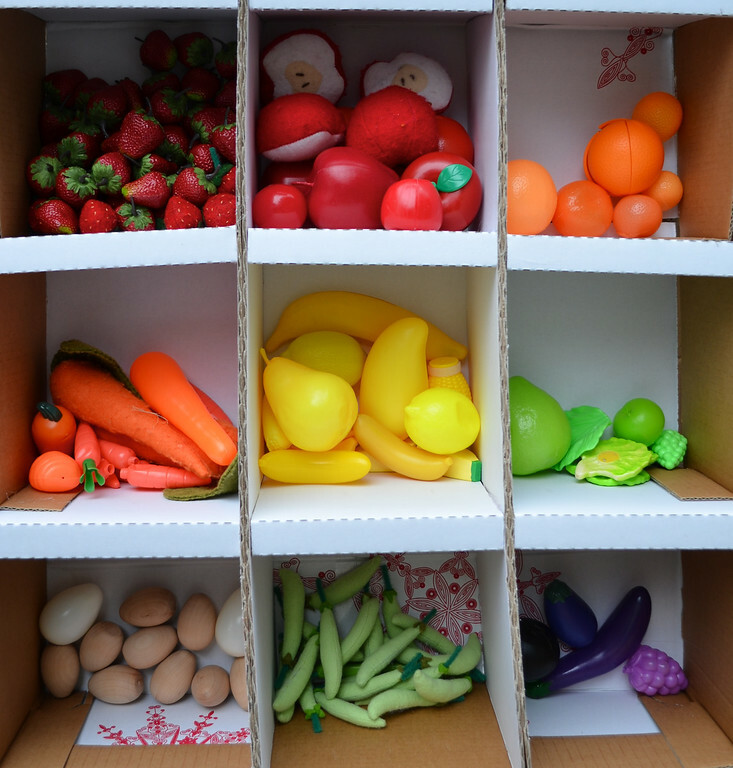 I definitely will share this week on a "Playing Grocery" theme party post! Love this! Thanks so much for sharing!I wanted to buy my girls one for Christmas but couldn't so now I'm going to make one. They will love it! I absolutely love this thanks for the share! This is so creative! You did a wonderful job!Who wouldn't want to play here?